On the highway this morning doing around 75mph I started to notice that I was having to press the pedal more than usual and was slowly losing speed. Luckily I wasn't too far out of town and pulled off to head back home. Before too long I was barely maintaining the 30mph speed limit in town and had cars stacked up behind me. It was getting progressively worse and after about a mile was crawling along at 10-15 mph. At this point I pulled off into a parking lot and turned it off while I waited for my wife to arrive. After she arrived about 10 minutes later I went to start it and it sputtered and died. Another crank and it sputtered a little but then idled fine. But still no power, absolutely crawling at maybe 5mph. While I was crawling along I started up Torque Pro on my phone to take a look at things. With the pedal to the floor the IPR duty cycle was around 85% but my HPOP pressure was only showing around 500psi. FICM main power read 49V, exhaust looked normal and no rough idle, so I'm thinking it's probably not the FICM. Given the way it sputtered and had a hard time starting after 10 minutes shut down - but then idled smoothly once started - I was thinking that the HPO system had lost pressure in that 10 minutes, so maybe this points to a leak in the HPO system like maybe a broken o-ring? As opposed to a faulty sensor or electrical problems? While deferring to some of the more experienced techs on here, it sounds like a HPOP or high pressure oil system leak. What does the IPR and ICP say when cranking the engine? Check it cold and then hot. Does it cold start OK? Last edited by Ford06; 01-24-2019 at 02:14 PM. Thanks for the reply. Yeah, the code is definitely injector pressure too low, I was just trying to gain a little more confidence that it's an actual leak as opposed to some faulty sensor or wiring so I have a better idea what to look for. I think you're right, though, I'm leaning toward it being an actual leak. I'm not going to be able to touch the truck until maybe Sunday now, but I'll definitely get those readings while cranking and get back to you. What should I be looking for with those readings? When I warm-started it Wednesday morning after only being off for ~10 minutes it had some trouble getting started - sputtered and died, then sputtered again before running smoothly. So right now I'm thinking it will probably be similar probably a little harder to get going but will then probably run smoothly. But I'll let you know about that as well. My thinking is that this hard start after 10 min points to an actual leak because the HPO system would have lost pressure while it was off and would have to build it up again while cranking before it could operate the injectors. Hopefully my logic in this case is not too flawed, but somebody please correct me if it is! I see you have a 2004. Which engine? Early or late? Is the ICP on the passenger side valve cover? If so it is a late model engine which will have the standpipe/dummy plug and STC leakage issues. See the sticky note at the top of the forum and read abpot the air test for leakage. Also, have you done the blue spring upgrade to the fuel pressure regulator? Ford06, to your question... Just went out and started it. It cranked a long time, maybe 20-30 seconds but then idled smoothly. During crank, IPR duty cycle was ~85% and the ICP climbed up past 500 and then after it started showed between 800-1000, so I thought I'd better drive it up the street. While I'm trying to accelerate the pressure drops to right around 500, but when I let it idle it goes back up to 800-1000 - even got as high as 1200 at one point. It is a newer 04, so I will keep the leaky plug and STC issues in mind. It has over 300,000 miles on it so any of those things could be worn out. The other thing that comes to mind is that if I accelerate while in neutral/park, the RPMs go up pretty much like they should. My guess is that when it's not under load it still doesn't need that much fuel to rev up, so the injectors aren't sucking up a lot of the oil pressure. And when I'm accelerating under load, the injectors consume what high pressure the HPOP can maintain with the leak Does that sound right? So right now I'm assuming that it is a leak and planning to start pulling it apart, first getting into the valve covers to check the oil rails and stand pipes and the connections to the injectors, then get down to the HPOP and see what I see there. An 04 doesn't have the failure prone "STC" fitting. Only 05 and up. With over 300k miles, I am surprised that the HPOP is still good (assuming it is still original). Last edited by bismic; 01-26-2019 at 03:34 PM. The pump in the video appears to be a newer style pump, but I think the idea is the same. Anyway, so I think the HPOP has gone bad. It wasn't as obvious as the one in the video, but when we put air on the output port and a finger over the inlet port, and turned the wheel, we'd feel air kind of popping out the inlet port. Though not freely flowing, air was definitely moving the wrong direction through the pump. On a good HPOP there should be zero back-flow through the pump regardless of if the wheel is turning or not, right? Sounds like a bad HPOP to me. The original served you well! IMO you should air test once the high pressure oil system has been re-assembled. Thank you for the reply Bismic. Do you mean where you take the ICP sensor out and put compressed air into the oil rail with a special fitting? I don't currently have a fitting to do that but I'll do some Google-fu and see if I can't figure out how to make one. It does seem like a good idea to do that test too. So what do you all think about this? I've talked to him before and he seems to know what he's talking about, but nobody knows everything. It seems to me that the pump must have some kind of check-valve in it because air flows freely inlet -> outlet, and for the most part doesn't flow at all outlet -> inlet (except for pops of air as you turn the wheel), so it seems to me like air probably should not flow backwards. I've ordered the air compressor ICP fitting so I can do a proper air test of the system, but what's the truth about these pumps? Should air be able to move the wrong direction through the pump at all, even a little bit? My experience is that you can leak a little air at the shaft seal, but not any in reverse flow. I am sure that some SMALL amount may be acceptable (not ideal though), but there is no way to quantify that. 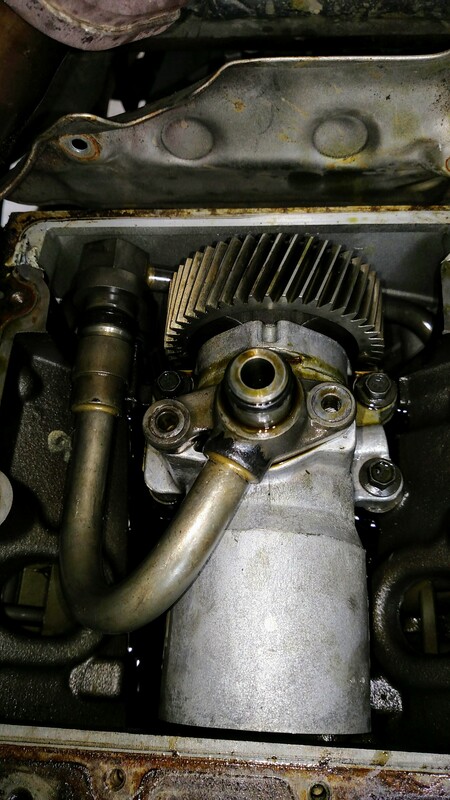 The thing about the HPOP's is that the OEM, and many of the aftermarket pumps, are marginal in quality/longevity. To get an HPOP that will last, it will cost you (unless you get lucky like you did w/ your OEM pump). The Dieselsite Adrenaline pump is the best one available. It is costly at $900. CNCFab has a good pump also, but they have been out of stock for a while. Both these pumps have been modified to fix some inherent design issues w/ the 03 and 04 pumps. I agree that doing the air test of the high pressure oil system is the best idea. To do that, you put air in the ICP fitting and close the IPR valve, or buy the test fitting for the IPR valve port and test it there (then you don't have to mess with closing the IPR valve). That said, since you have 200k miles on the original and the system is open, it can save you a lot of trouble in the future by replacing it with an upgraded pump. The 100% positive way to condemn an HPOP is when you hear air gurgling form the oil filter housing when doing the air test on the HPO system (pull the oil filter to listen). The gurgling sound means unacceptable air back flow through the pump. Looks like the CNCFab pump is still out of stock. Last edited by bismic; 02-20-2019 at 09:29 AM. Since you have the late 04, the dummy plugs and standpipes o the oil rails are common leak points, so you definitely need to check them with an air test. IMO the best way to do the air test is with the IPR test fitting and put air through it. Also, the injectors may be leaking, so having the valve covers off so you can hear leaks (if any) at each injector is almost a requirement. Best to do the air test with hot oil. You need to give the air time to push the oil out of the system, which happens faster with hot oil. Took the valve covers off and did the air test using the IPR test fitting, and listened for escaping air all around the oil rails on both sides. Didn't hear any leaks around the oil rails or from the filter housing but air was obviously escaping somewhere because my compressor would keep kicking on every 2-3 minutes. Using a tube to listen through, I could hear what sounded like faint sounds of air escaping at the back end of both oil rails where the stand pipes connect. It was very faint though. But when I put my listening tube up to the hole in the front of the HPOP cover where the turbo drains into, I could hear the sound much more clearly. So now I'm thinking it's one or more of the o-rings in there, in the piping between the HPOP and the stand pipes. My plan now is to get an o-ring kit and replace as many of them as I can and then just put it all back together. If o-rings fix it, great, if not I'm taking it to the pro's. Last edited by bismic; 02-24-2019 at 07:51 AM.